The Word: Two of Week 1’s biggest disappointments. Will C.J. Spiller provide another thriller at Ralph Wilson Stadium? The Word: Battle of Ohio edition 78. Neither team wants to lose to their state rival nor fall to 0 and 2. The Word: Christian Ponder can relate to Andrew Luck’s current situation. How will the number one overall pick respond in his first home game? The Word: All bounty talk aside, this is Drew Brees versus Cam Newton. Grab your popcorn. The Word: Blaine Gabbert appears to have made progress from last season. He will have to make a whole lot more for this game to competitive. The Word: The Dolphins went winless during the preseason and of course took one on the nose in their opener. Expect the team out of South Beach to remain “defeated” this week. The Word: Kevin Kolb is getting another shot at the starting job. His first present, a trip to Foxborough. The Word: Both of these teams surprised in their openers. One for the better and one for the worse. The defending champs lost sleep over their lackluster opening night performance. A loss Sunday would provide a months worth of nightmares and sleepless nights. The Word: I never thought I would see the day where I said this: Flacco>Vick. The Word: All eyes will be focused on Robert Griffin III fresh off of his amazing debut. The Word: The Cowboys have not started a season 2 and 0 in four years. That will change on Sunday. The Word: So is the Jets offense inept or unstoppable? We will get a much better idea at Heinz Field Sunday. The Word: Since Philip Rivers took over as San Diego’s starting QB, the Chargers are 22 and 3 when they do not commit a turnover. Turnovers will be the key on Sunday. 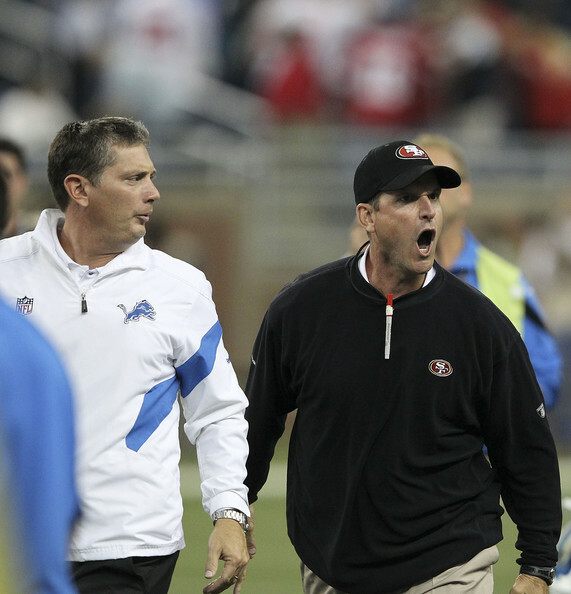 The Word: Jim Schwartz versus Jim Harbaugh part two. Which coach will put his money where his mouth is? The Word: Both Matt Ryan and Peyton Manning hushed their critics with big-time performances in Week 1. Keep an eye on the battle between Atlanta’s talented receivers and Denver’s outstanding secondary. The winner of this battle will likely determine the winner of the game. These teams are both contenders in the NFC and polar opposites in their style of play. Detroit is a team that tosses the pigskin from start to finish. The San Francisco 49ers are a team with arguably the best defense in the game. That is not what anyone is focused on though. All of the attention is focused on the “postgame handshake” shenanigans that went down following their Week 6 meeting last season. Both of these proud franchises ended extended playoff droughts last season. In terms of the matchup, Detroit has lost all six meetings to San Francisco since 2001. The 49ers are flying high after a huge victory over Green Bay at historic Lambeau Field. Remember, after every high there is a low. You won’t want to miss this showdown between NFC contenders at Candlestick Park. 20 is the number to keep in mind. Detroit set offensive franchise records galore in 2011, scoring 474 points on the season (only the second time in franchise history they had scored more than 400 in a season). In addition, Detroit scored under 20 points just six times during the 2011 campaign. On five of these occasions they lost. In addition, during the six meetings with the 49ers since 2001, Detroit has never scored 20 or more points, resulting in six losses. If Detroit cannot put up 20, which will be no easy task against an outstanding San Francisco defense, they will lose. BD: The underdog Vegas line that I like this week is the St. Louis Rams (+3) against the Washington Redskins. In general, if you can find a team that is overhyped and overvalued by the public, bet against them. St. Louis is a seventh ranked pass defense from last year that gave Matthew Stafford, an established NFL quarterback, fits last week. The St. Louis Rams, on the other hand, received zero press for their impressive Week 1 performance against a 10-6 playoff team from last year in Detroit. I’ll take the underrated, improved, and balanced St. Louis Rams offense and defense, against the rookies Robert Griffin III and Alfred Morris. CB: The game of the week is without question Denver at Atlanta. These were two of the more impressive teams in Week 1. Both teams looked great on offense in the opener. Peyton Manning was back to his old self by being able to contain one of the most potent defenses in the NFL last week, while Matt Ryan shredded the Chiefs defense. I look for this game to be high scoring and for the Broncos to come out victorious. CV3: The first impressions have been made for the 2012-2013 season. The 49ers said we are back and ready to dominate as did the Ravens. The Redskins, Jets, and Falcons all put up 40+ points. Some teams flopped last week, namely the Bengals and Saints. This should make for an interesting season with new teams rising to elite status. If your team did not impress in the opener, keep in mind that every team will lose at least one game this season. So don’t take a Week 1 loss too hard, unless you are the Browns. Looking forward to Week 2 with some pretty close matchups coming out of the NFC. TSK: Week 1 was an offensive exhibition. Expect much of the same in Week 2 and throughout the 2012 season as the NFL becomes more pass happy than anyone could have ever imagined. Three games have really caught my attention: Jets/Steelers, Lions/49ers, and Broncos/Falcons. The Jets/Steelers game will be a test of manhood. The game in San Francisco will answer the old question regarding great offense versus great defense. And the game in Atlanta will match up two of the NFL’s elite quarterbacks on football’s biggest stage. This entry was posted in NFL and tagged AFC, Alfred Morris, Andrew Luck, Blaine Gabbert, C.J. Spiller, Cam Newton, Christian Ponder, Drew Brees, Heisman Trophy, Jim Harbaugh, Jim Schwartz, Joe Flacco, Kevin Kolb, Matt Ryan, Matthew Stafford, Michael Vick, NFC, NFL, Peyton Manning, Philip Rivers, Robert Griffin III. Bookmark the permalink.